Day 2: Ellen is relaxed! We slept relatively well and woke up close to adjusted to the time difference. The hotel provides a basic breakfast: juice, coffee/tea and breads. 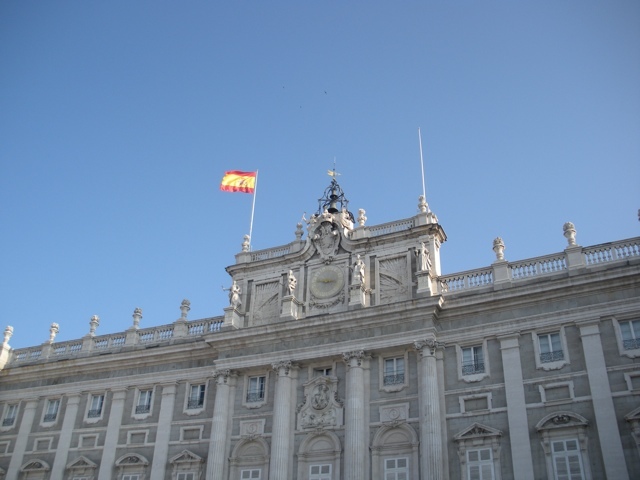 First stop today was the Royal Palace, less than a 5 minute walk from our hotel. No longer used as a residence, it serves as a location for formal diplomacy and ceremonies. Much of the furniture and decoration dates back to the 16th century, reminding me as Europe always does that their history goes back millennia while ours barely centuries. When leaving the palace, we heard cheering nearby. We came across runners in a road race, we later found out to be the Madrid Marathon. It is said to have a beautiful course, but difficult because of the 700 meter altitude and hills. Glad to be a spectator at this race. A walking tour took us first to the Mercado de San Miguel, a recently renovated indoor market with stalls that served all sorts of delicacies. 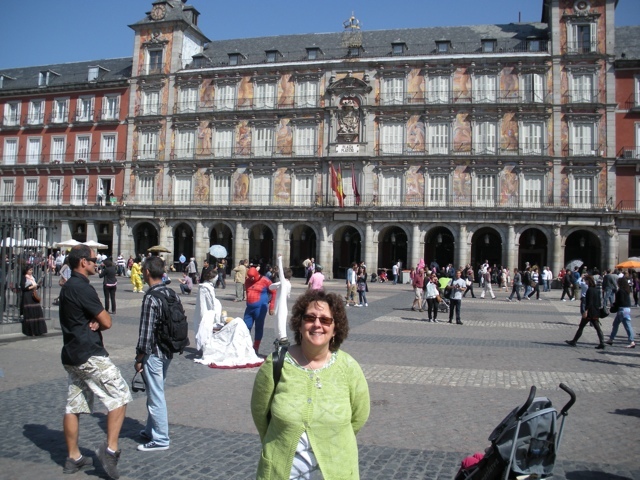 Next stop was Plaza !ayor, the most beautiful square in Madrid. We kept saying we just don’t have anything like this at home. Because it was Sunday, we were able to visit the El Rastro flea market, a famous huge set of stalls selling all sorts of non-essential t-shirts, jewelry and other junk. We finished the walking tour, then returned to the hotel for a short stay. Next up was quasi-lunch, just a few items bought from the bakery of the department store. 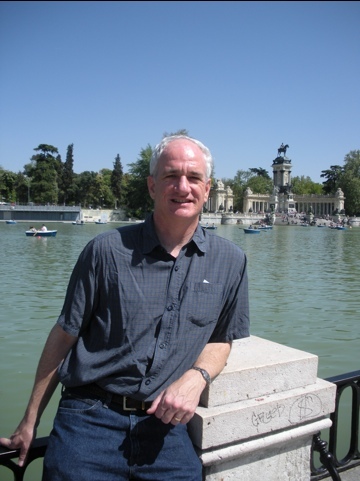 We then took the subway for the first time a few stops to the Retiro Park. A former royal park, it is now a hugely popular soot for picnics, row boating and sunbathing. We found a nice place to enjoy our beer/Coca Cola Light combo. I napped in the sun, it felt so good to relax and not worry about anything. Ellen especially always wants to be going somewhere and doing something, it was nice to see her enjoying the park and the sun, without a care. We eventually returned to the hotel and asked for help with dinner reservations. Not quite adjusted to Spanish ways, the concierge apologized when making a 8pm reservation, explaining to the restaurant that we were “Americanos.”. We ate at a seafood restaurant, La Mar del Alabardero, which was related and around the corner from where we had dinner last night. This restaurant was right on the plaza facing the royal palace. 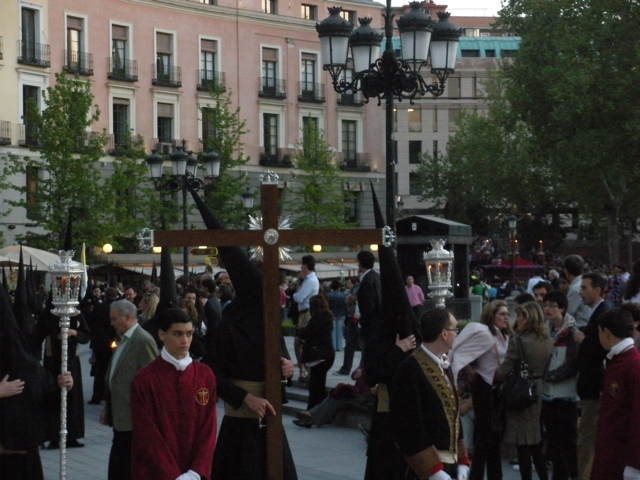 During dinner, we lucked into seeing a Palm Sunday parade, complete with costumes that resembled black KKK costumes. Ellen had seafood paella and I had a whole rockfish. 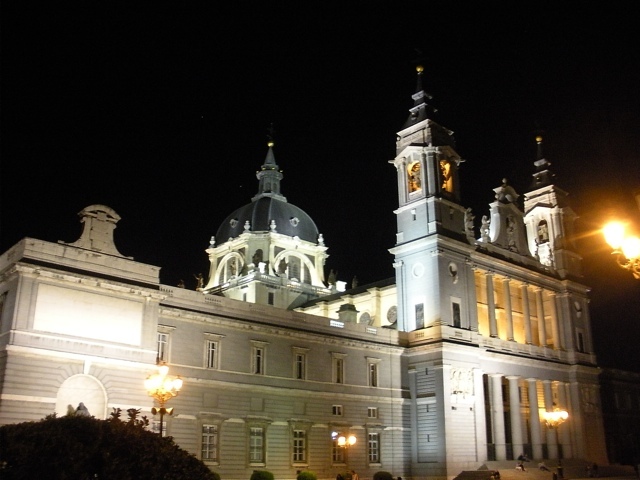 After dinner, we strolled by the royal palace, it looked beautiful lit up. We are off for our one day trip tomorrow to Toledo. This entry was posted on Sunday, April 17th, 2011 at 8:37 pm	and posted in Madrid, Spain. You can follow any responses to this entry through the RSS 2.0 feed.